Shortbread, a traditional Scottish baked good is a type of cookie with high butter content. Since butter was such an important ingredient here, so the word 'shortbread' is derived from this shortening (butter). The traditional recipe of these cookies is one part sugar, two parts butter with three parts flour; but these days, there are a lot of varieties in the ingredients of the cookies. The shortbread are originated in Scotland and these cookies are called as the ancestor of all the butter cookies. Originally the shortbread are made with oatmeal. Some also adds cornstarch to get a more dense texture of the cookies where as some adds rice flour for a grainy and crumbly texture. Well, Monday is here again !! This time the Foodie Monday Blog Hop team has decided the theme no 172 as 'International Feast' which in details means that we have to prepare a dish from any one country whose name starts with the first letter of corresponding member's name. So for me obviously it is the letter 'S' 😉 and I chosen the country S for 'Scotland'. From the Scottish cuisine, I have picked up the most famous shortbread cookies with some addition as 'Fruit & Nut Shortbread Cookies' for the contribution. These cookies are completely egg-free. The main ingredients of these cookies I have not changed at all, that means all purpose flour, butter and sugar are used here. In addition to those, I have flavored the cookies with some vanilla essence and orange zest. If orange essence is available at your place, then that can be used directly in place of vanilla essence and orange zest. 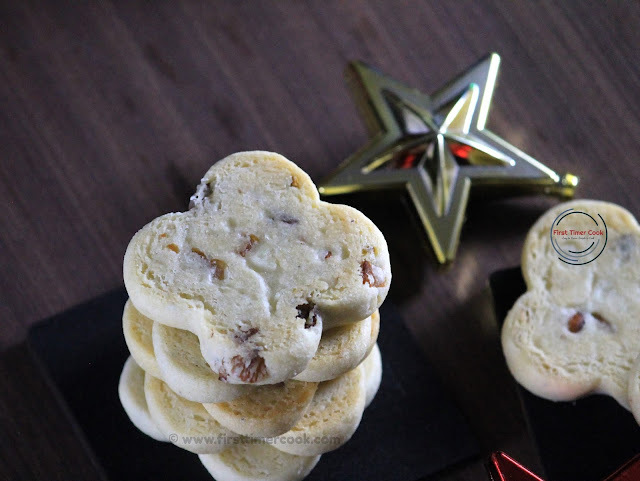 To give a nutty texture in the cookies, I have added some chopped nuts like cashew, almond, pistachio, raisin and dried fruits like apricot. But these selections of fruits and nuts can be totally varied as desired. These buttery goodies are perfectly fit for Christmas gifting ideas also. In a mixing bowl, first mix butter and powdered sugar using a hand whisk until a creamy texture. Next add orange zest, vanilla essence and mix very well. Add the flour and mix well to get a soft non-sticky dough. Finally add all the chopped fruits and nuts to the dough and again mix well. Divide the dough into desired number of balls. Give any shape or just flatten each dough ball and place over a plate. Keep in refrigerator for at least 1 hour or until the cookies firm up nicely. Before taking out from refrigerator, preheat the oven at 160 deg C.
Transfer the cookies to a baking tray lined with parchment paper leaving 1 inch space between each cookie as these tend to expand. Then take out the baking tray from the oven and allow to cool down completely. Store all the fruit and nut shortbread cookies in an airtight jars and serve as desired ! Use 1 pinch of salt if not using salted butter. All the fruits and nuts used here is totally as per choice. Putting in the refrigerator is important here. This process will make the cookies to have a perfect texture once baked and also don't allow the cookies to expand much while baking . Oh, wow! These cookies look amazing! :) So perfect! 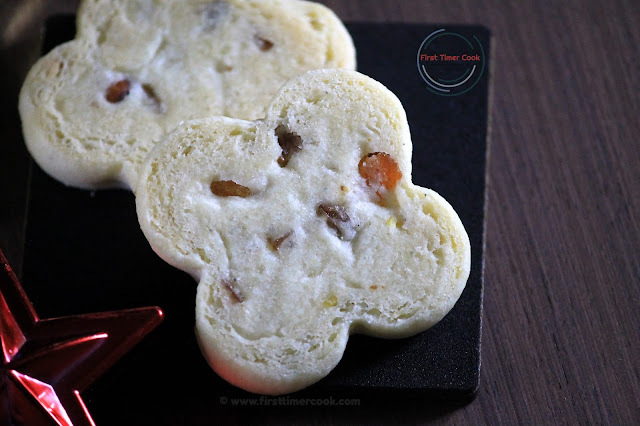 My kids would love these :) Scrumptious , buttery and perfect for the holiday bakes ;) well done Sasmita ! My kids love cookies and these look so delicious!! Surely will try these!! 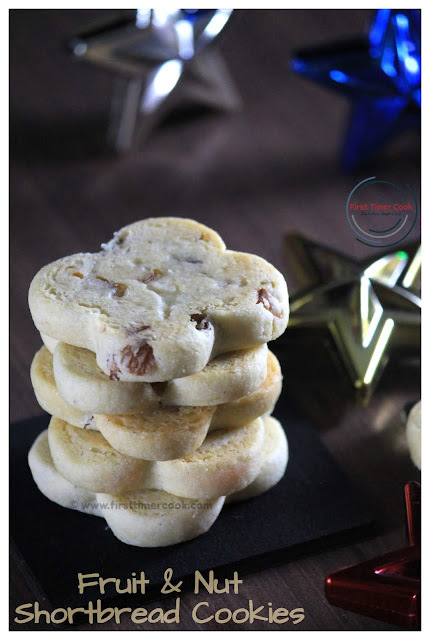 Wow Sasmita, love the shape of these shortbreads. My favorite kind of cookies and so easy to make. Scottish Shortbread is definitely very very buttery and delicious. These are so cute. on a christmas platter these cookies are going to be the star, I am going to make some to hang on the tree. Shortbreads are my weakness, they have an amazing texture and is melt in mouth, just like what your cookies look to me. Superbly done Sasmita! These buttery cookies look so festive Sasmita ! Buttery , perfectly shaped and oh so beautiful ! Love the shape of these buttery cookies. Drooling looking at the pictures.